Since I’ve been often asked how I got into photography, I’d like to look back with you two decades ago, when photography took a front row position in my life. Although the first camera that I used was a prize won in a photo contest (cameras were loaned to contestants for a day) at about age 10, as a child and teenager I was more actively involved in music (I used to play the violin). When it came to art appreciation, I was much more interested in paintings than photography. A favorite hobby was to visit the great European museums. Vietnamese families in general are not outdoorsy, and mine, although better than most, was no exception. Even though, in France, skiing is such a popular vacation activity that I grew to like the sport. In the eighties, friends in my college’s mountaineering club invited me to join a ski-mountaineering outing. You use downhill skis with a special binding where your heel can be freed for walking up with the aid of skins that you stick below your skis so that you don’t slide backwards while climbing. Free from the need of ski lifts, pristine mountains become your playground, away from the crowds, machinery, and development. My life, which so far had been largely urban, was quickly transformed by the wilderness of mountains. I felt that although so close, the High Alps were a world apart from anything I had seen so far in my life. The engagement and effort of mountain climbing only magnified the emotions of being in such a special place. 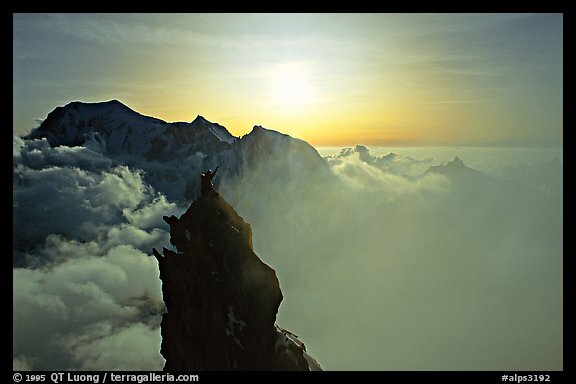 Much like Galen Rowell before, as I became a climber and then a mountain guide, I got interested in photography as a means to communicate to people who weren’t there the wonders I had seen on the high peaks of the Alps. This is one of my first memorable image. It captures an example of the magic of the high mountains, the “Broken Spectre”, an apparition-like atmospheric condition of shadows thrown up clouds behind an object. This was taken with a Minox camera that I always carried in the chest pocket of my climbing bibs. Although it can look large compared to today’s ultra-compact digital cameras, in the days of ilm, because of the size of the cartridge and the need for the lens to illuminate a “full-size” 24x36mm frame – which is larger than 99.9% (99.99% ?) of today’s digital cameras – the Minox was truly tiny compared to other cameras with manual controls. I was very fond of the Minox. For a few years, this was all I was willing to commit to photography while climbing. 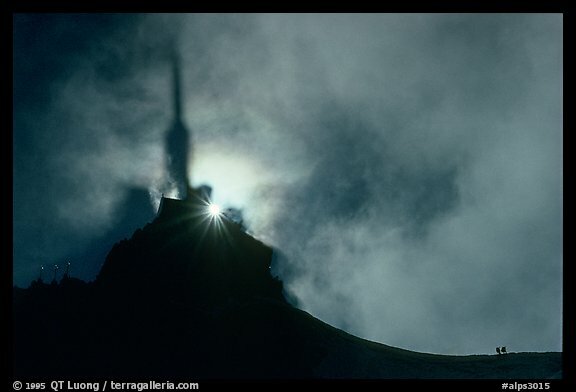 On one of the last days of the summer of 1992, I guided a group from the French Alpine Club up the Dent du Geant (Giant’s Tooth), in the Mont-Blanc range. 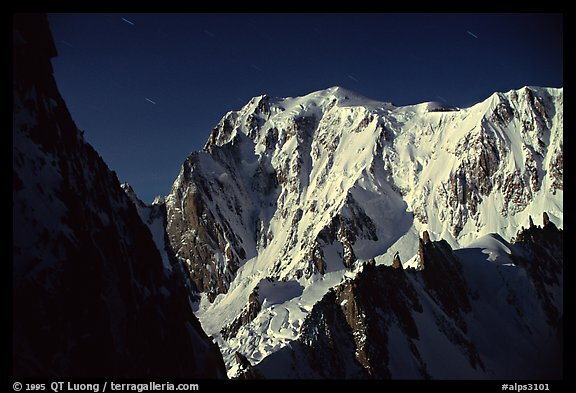 Because the route, steep and technical, was on the South Face of the peak, the view of Mont-Blanc was obscured. One of my fascination with climbing mountains has always been the curiosity about what you can see on the other side, when you got to the top. That evening, clouds and fog rolling in below us close to sunset time, the view from the top was just stunning. The peak had two distinct pinnacles at the top, which allowed me to frame that view of the other members of the group from the main pinnacle, as they stood from the secondary pinnacle. Now, if you have any experience in technical mountaineering, you will ask: “What were you doing there on that peak that late, since the climb isn’t that long ?”. 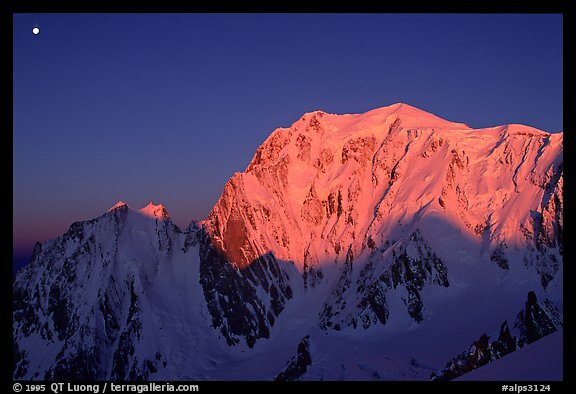 The answer is that the timing was planned that way, so that we would reach the peak in time for the “golden light” before having to descent the peak with our headlamps in partial darkness. I was also carrying a SLR camera with a 24mm wide-angle lens (the Minox was limited to a fixed 35mm lens). Photography had become the main goal, rather than simply climbing, with recording images a byproduct. This was actually not the first time I planned a climb for photography. 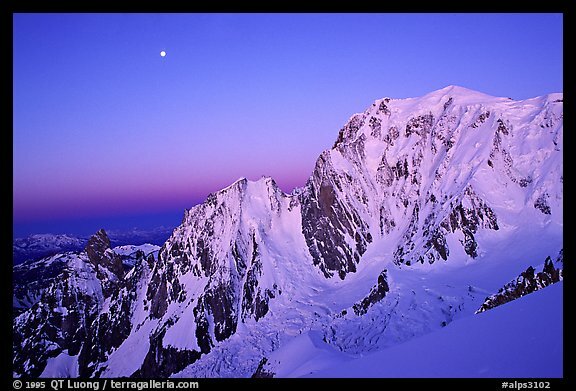 Earlier in that 1992 summer, I bivied on the summit of the Tour Ronde, so that I would be able to photograph the dawn and sunrise light on the East Face of Mont Blanc. However, what makes the Dent du Geant special is that it happened to be my last alpine climb in the Alps, a mountain range that had giving me so much, awakening me to a new world. A few weeks latter, I would hurt my knee in a bicycle accident, which would put me out of commission for the rest of the year. In early 1993, I would travel to the US, for what was initially planned as a short term stay as a visiting researcher at UC Berkeley. I came to the US simply out of curiosity, as I wanted to see and experience up close a country that was some dominant. I could not guess that I was soon due for another life-changing experience. Posted on August 23, 2009, 3:21 am, by QT Luong, under Recollections. Very interesting entry. After a decade of participating on the LF forum you founded I didn’t know much about your life journey. Looking forward to more. Welcome to the blogosphere, QT! With any luck you will find your audience quickly, and it will become an enjoyable and rewarding conversation. I look forward to following your travels, good luck QT! I concur with Sal’s comment. The LF site you founded has been a major influence on my life the last ten years or so, but I know little about you, with the exception of your work in the national parks. I also look forward to future installments. Great blog, QT ! beautiful work, I will look forward to future posts. Best origin of photographic interest story ever! Love your photography you’ll help me plan plenty of trips! Your work has been a major source of inspiration and its very nice to know bit more about you. Look forward to your future posts. Great write-up QT. As I’ve mentioned before, I found you through your climbing exploits before connecting with you in the photography circles (and I admired your climbing as much as your photography!). It’s really nice to see your earlier work here.